It’s the beautifully-written piece you’d hope to read from a newly-awarded professor of music, but I thought it well worth quoting Bill Bruford’s tribute to Chris Squire in full (with apologies for tardiness), which I believe first appeared on the Yes website. 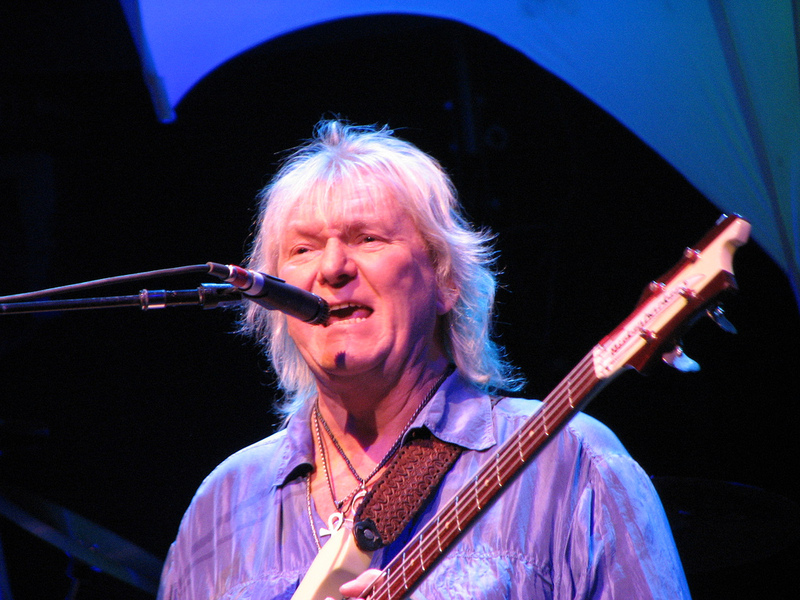 ‘Really saddened to hear of the death of my old Yes band-mate, Chris Squire. I shall remember him fondly; one of the twin rocks upon which Yes was founded and, I believe, the only member to have been present and correct, Rickenbacker at the ready, on every tour. He and I had a working relationship built around our differences. Despite, or perhaps because of, the old chestnut about creative tension, it seemed, strangely, to work. He had an approach that contrasted sharply with the somewhat monotonic, immobile bass parts of today. His lines were important; counter-melodic structural components that you were as likely to go away humming as the top line melody; little stand-alone works of art in themselves. Whenever I think of him, which is not infrequently, I think of the over-driven fuzz of the sinewy staccato hits in ‘Close to the Edge’ (6’04” and on) or a couple of minutes later where he sounds like a tuba (8’.00”). While he may have taken a while to arrive at the finished article, it was always worth waiting for. And then he would sing a different part on top. An individualist in an age when it was possible to establish individuality, Chris fearlessly staked out a whole protectorate of bass playing in which he was lord and master. I suspect he knew not only that he gave millions of people pleasure with his music, but also that he was fortunate to be able to do so. I offer sincere condolences to his family. In my recent piece on Chris’s sad passing and bass style, I put forward my half-arsed theories on his ’80s tunings. I stand corrected, as the excellent video below shows. The whole thing is worth watching, but he gets into the issue of his five-string bass at around 12:10 (and also rattles off a nice demonstration of the ‘I’m Running’ riff). Needless to say, his approaches to the five-string bass and bass tunings in general are as original as all his other musical ideas. Enjoy. Even solely based on the evidence of his rather unappreciated ’80s playing, Chris Squire would surely still get into the pantheon of bass greats. I first heard him on Yes’s 1987 album Big Generator and worked backwards from there. I was won over by Trevor Horn’s pristine production, the band’s outrageous musicianship and the sheer originality of the songwriting, but recently Chris’s bass playing from the era is kind of obsessing me. To my ears, he detuned his low E string on a standard four-string bass to a low A, one octave lower than the second string, presumably to best accompany the new songs which generally tended towards A major. You can hear it most clearly on the powerful title track and ‘Love Will Find A Way’. Anyone who’s ever picked up a bass will know how potentially treacherous that tuning could be, but he just sails through. It also gives him a massive melodic range, from the funky twang of the ‘I’m Running’ riff, to the brutal low-end grooves of the title track and ‘Almost Like Love’. The 1983 Yes album 90125 is also full of great Squire moments (with mostly regular tuning this time), from the catchy riff underpinning ‘It Could Happen To You’ to the flanger freakout ‘Cinema’ and rifftastic ‘City Of Love’. He really extended the Paul McCartney melodic bass concept into exciting new territories. Sadly, sometimes it takes a great player’s passing to spur you on to check out music that has thus far escaped you, so the 1980 album Drama is my latest discovery. The lead-off track ‘Machine Messiah’ and ‘Does It Really Happen’ are chock-full of classic Squire moments and I’m sure loads more will reveal themselves. I must also investigate his short-lived project XYZ alongside Jimmy Page and Robert Plant. By all accounts, Chris was a great and totally unique character too. RIP to a definite lord of the low end. Steve Martin in…Homage To Steve! My thoughts and writings on jazz and the world around it.